Henri Lebasque was born in 1865 in Champigné. After attending secondary school in Angers, he enrolled at the École des Beaux Arts in the same town, as his passion for art began to show very early on. In 1885, at the age of twenty, he was declared unfit for service due to his rheumatism, which he suffered all his life, and moved to Paris. While attending Bonnat's classes, he earned a living working as a decorator, which he found rather tedious. However, he was always good-humoured, as his inner joy never left him. In 1893 he met Luce and Signac at the Salon des Indépendants. Divisionism had just appeared and, like Cross and Van Rysselberghe, Lebasque could not totally escape the influence of Seurat's technique. But very soon Lebasque abandoned this school whose limits were too narrow and restrictive for an artist who liked above all to show in his paintings his own vision of nature. Similarly, his friendship with the Fauves and with Manguin never prevailed over his slightly introvert, but also tenacious, personality. Married and with children, Lebasque moved to the east of Paris in 1900 and remained there until 1906; he took up residence first in Pierrefonds and Montévrain, where the neo-Impressionists met up. Lebasque was using some Pointillism when he moved with his family to Lagny, on the banks of the Marne, where he stayed for about five years. This was one of the most fruitful periods of his life. There, still under the influence of Impressionism, he was overcome by the joy of painting outside; his pictures already reflected his joie de vivre. His landscapes, bright or delicately coloured, are full of freshness, while at the same time they convey the soft light of the Île-de-France. In the Marne valley he found a myriad of simple and pretty landscapes and a river running quietly between grassy verges, often lined with trees; the light is slightly filtered, almost damp, and gives his paintings a charming delicacy. In the area of Lagny Lebasque had also met Pissarro, and his luminosity influenced him more than the remembrance of Bonnat's teaching. Here, the artist led a simple life, contemplating nature and its changes with the passing of hours and days. In such quiet surroundings, his talent gradually developed and asserted itself. 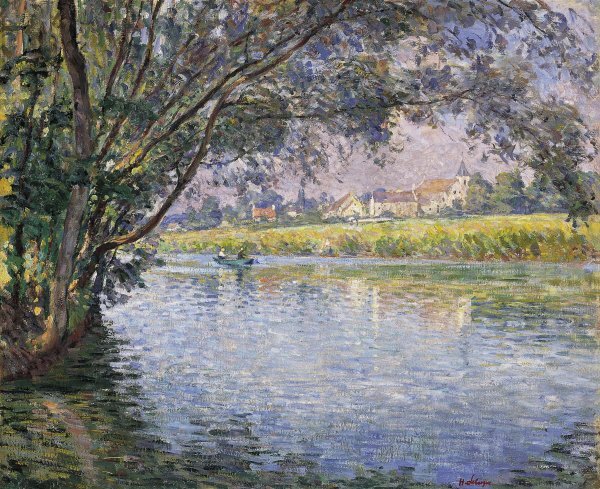 It was during these laborious years that Lebasque painted many times the banks of the Marne, under a sky tinted with subtle hues, in which he expressed the deep emotions conveyed by the delicate light of the Île-de-France, which reminds us of Sisley's paintings. The rustling trees, whose branches filter the light, frame the scenery with bright meadows spreading in perspective. Nobody has summed up better Lebasque and his art than Louis Vauxcelles in the catalogue of the exhibition held at the Galerie Pétridès in 1938: "Lebasque was as intelligent as he was sensitive, impulsive, with his own personal culture, and he never ceased to reflect upon the principles and conditions of his art. Technique, the study of form, the concern for balance and rhythm obsessed him. Nevertheless, he had kept the divine gift of childhood, marvelling at the vast spectacle of Nature, and he knew that, according to Nietzsche's words, for a poet, "to say no to nature is madness." He painted as a bird sings, when it sings well-a smooth and expressive drawing, elegance of lines, freshness and haziness, transparency of shadows [...]"
But Lebasque soon grew tired of systematic, monotonous, impersonal Pointillism, as fantasy and the painter's own temperament did not counterbalance the strictness of the theory. It was precisely before the views of the banks of the Marne at Montévrain and at Lagny, contemplating the wide and quiet landscapes through which runs the shimmering river bordered with meadows that, in 1900, Lebasque painted Banks of the River Marne near Montévrain, in which he reveals his full spontaneity. Deep inside, Lebasque was a landscape painter, but not just that; he was too sensitive for his paintings to be "uninhabited." This view of the Marne could not do without the presence of a boat with two fishermen. In Lebasque, quietness and serenity do not exclude life, but it is set in nature, and is as if framed by it. The village and its bell tower are there, in the background, bearing witness to the perfect communion between Nature and its inhabitants.